Wisconsin protesters are still protesting in the Capitol. The Associated Press is reporting that Republican backers of Gov. 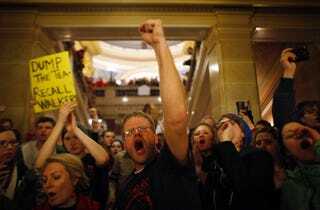 Scott Walker's plan to eliminate collective bargaining rights for most public employees are trying to move the explosive proposal closer to reality, even as Democrats remained on the run and protesters filled the halls of the Capitol for a second week. The Republican-controlled Assembly planned to debate and possibly vote on the measure Tuesday, but Democrats said they would offer more than 100 amendments in an attempt to improve the bill or at least drag it out in the hopes that concessions will be made. Democrats have not reported to the Senate since Thursday. While there is other business to be handled — like a resolution honoring the Green Bay Packers for winning the Super Bowl and a bill extending tax breaks to dairy farmers, both of which have bipartisan support — both parties are deadlocked on the collective bargaining issue. Walker says he won't negotiate, and the 14 missing Democrats say they will not return unless he does. Can you say a game of "political chicken"? Public employees have said that they would agree to concessions Walker wants that would amount to an 8 percent pay cut on average, but they want to retain their collective bargaining rights. One Republican senator also has floated an alternative that would make the elimination of those rights temporary. Like the protesters are going to buy that. Folks have to protect their interests because it is abundantly clear if they don't, they will be exploited. Unions developed for a reason. It's pretty simple. If government and industry were willing to treat workers fairly, then they wouldn't be needed. Either you're going to do the right thing on the front end or be made to do the right thing on the back end. Sadly, it's usually the latter. In other news: The Root Recommends: Adele.